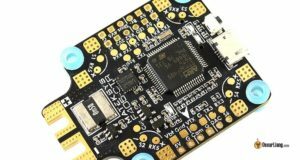 The Matek F405 CTR flight controller has just been released, which is to replace the Matek F405 AIO with lots of improvement changes. Could the Matek CTR be the next perfect F4 FC? Let’s find out! I will be testing this FC in the coming days, and I am excited about this new FC because it ticks a lot of right boxes for me! Here is a specification comparison table between the Matek F405 CTR and the older version, Matek F4 AIO. Take a look at our review of the Matek F405 AIO FC if you haven’t already. The CTR FC comes with 6 rubber grommets (2 spare), and a Rubycon ZLH 470uF 35V Low ESR capacitor, the same one that came with the AIO FC. In my opinion the cap is a bit too small, I would love to see they include a 1000uF at least. Further Reading: Why putting additional capacitor in a mini quad? 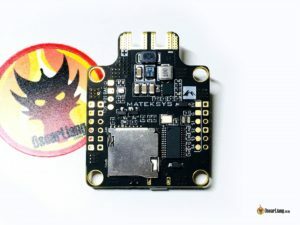 Betaflight firmware target remains the same, MATEK F405 (MKF4). It might not look like a lot of changes in terms of spec, but the design has been much improved in my opinion, there are many features I like that are missing on other FC’s. The Matek AIO FC used the ICM20602 IMU in order to run faster gyro sampling rate and looptime of 16KHz and even 32KHz. However this sensor is also very sensitive, many users of the AIO complained about getting yaw twitches due to noise, regardless of effort to soft-mount FC and add low ESR capacitors on the ESC’s (my suspicion is they are using very noisy ESC’s such as the Emax Bullet). The MPU6000 is an old IMU that is near its end of life, but it’s a proven option and is still preferred by many flight controller designers for its robustness against noise. Although I have been flying the AIO without any issues, I am happy to see them using the more trusted MPU6000. I don’t think many Betaflight users are running anything faster than 8K/8K anyway. Further Reading: Learn about the different Gyro’s in a flight controller. The barometer, or baro, is an atmospheric pressure sensor that can be used to estimate altitude. It’s useful for people flying long range and help make sure to stay within legal height (in many countries RC pilots are only allowed to fly under 400 feet). It’s also useful for pilots using the iNav firmware with GPS. There are now dedicated ESC telemetry pads right next to the ESC signal pads, which will make soldering much cleaner and easier. Further Reading: How to setup ESC Telemetry? In the AIO flight controller, we are supplied with 7mm tall rubber spacers for soft-mounting the board. While on the CTR, the mounting holes are enlarged to M4 in order to fit the silicone grommets for vibration damping. The new design can actually lower the stack by about 4mm (7mm vs 3mm), which is good news! The effectiveness of the silicone grommets is yet to be tested, but since we are using a “cleaner” Gyro, the requirement for soft mounting is much lower. Further Reading: Why soft mounting flight controller can help mini quad performance? Again, the CTR FC is meant to be mounted side way, and the XT60 tab comes out on right hand side just like the previous version. However the XT60 tab design has been changed from two large holes to two rectangular slots. I can see how this will make soldering the XT60 connector easier and more reliably, though I am not a big fan of soldering XT60 connectors directly on the FC, I always prefer to use some electrical wires in between. It just feels stronger. The DAC pin on the Matek F405 CTR is said to be a dedicated pin for FPV camera control, so that you can change FPV camera settings using your transmitter via OSD. However at this stage, I am not sure if this is a plug and play solution, or requires additional resistors to make it work. Matek has decided to remove the onboard 9V regulator. It was a great power source for our VTX and FPV cameras because many VTX still don’t support 5V nor LiPo voltage. Having 7V to 12V on the FC means better compatibility with other hardware. But that’s not a deal break since a lot of VTX these days supports 5V all the way up to 6S, you can either use the onboard 5V or power from LiPo battery. Here is a connection diagram of the Matek F405 CTR FC. I am not sure about their suggestion on how to connect a 4-in-1 ESC. Those ESC power pads on the flight controller are only rated for 30A (46A burst), it’s probably better to connect multiple pads to provide power to the 4-in-1 ESC’s. My FC comes with default scale value 400, which is incorrect. After calibration, my current sensor scale value is 179. It’s been reported that the scale value might be slightly different between boards, if that’s the case for you, please follow my guide on current sensor calibration to adjust yours. Default Voltage scale of 110 is correct. Any updates on the camera control feature with DAC? I have this FC and an Foxeer Monster V2? Can I use it without fiddling around with resistors etc.? We have not heard about progress on the DAC feature. I have a feeling maybe this might not happen at all, since more and more FPV cameras ship with UART, which you can connect directly to UART on the FC. does anyone know how to hook up a M8N gps/compass to the f.c.? What is the size of this fc as they only include the size of the pdb? Can I control with it quad + or is it only for x conf? Hi All, i have problem ob 405 ctr. The yaw twitch still there for right yaw only, anyone have same problem and solving it? please could you post your question on our forum? It’s easier for us to help you as i can only check blog comments a few times a week. Can I use battery with XT90 connector on this board? I’m new in this and I don’t really understand how it will affect on board. Yes you can. It won’t affect the board. setup ESC telemetry, and select “ESC Sensor” in the power tab for current. could you explain how the FC has to be mount correctly? These rubber grommets are suspect to me. Should i fasten the nut/bold as best as i can? What if i connect the lipo straight to the fc and straight to the 4 in 1 esc? Then you can’t use the current sensor on the FC, because the current is by-passed. Could I run the ground signal wire from the ESC to the negative power pad of the ESC instead of going all the way to the board? Well those grounds are most likely connected internally somewhere on the esc already… The purpose of running a separate ground wire for the signal cable is to balance the signal current, so that it cancels out self-inductance and isn’t radiating energy in every direction, like an antenna. “Signals” are “dc” alternating-currents (alternating between +v and 0v) with high frequencies, and unless you couple the signal to ground by using a twisted-pair or a coaxial cable, then that signal will always be radiating a magnetic field which is the source of electromagnetic interference in other nearby wires. Look up “twisted pair” and read about it; that is the most common and easiest method of routing signal wires. If you connect the signal ground to power ground then it defeats the purpose using signal ground really. Check out this article about grounds, different topics but same concept. Ok, I heard of the magnetic field that can be introduced in a system in this way but I never thought it will be worth canceling it. Thanks Adam. But Oscar, is what you say what is actualy happening here? The signal groun is connected to power ground. There is not a dedicated signal ground solder pad. I just saw a related video about signal ground and the word reactance came into play. I’m not sure with my limited knowledge about electronics if this is the case here. What is really important is the coupling of a signal wire to an identical “ground” wire; both wires will carry equal and opposite currents, so their induced magnetic fields are also equal and opposite. That is why they cancel out each other’s magnetic flux, and it means that there will not be a magnetic field to interfere with other wires. This idea of cancelling goes hand-in-hand with a basic universal law of physics: “If you have some force in one direction, and an equal force in the opposite direction, then the sum of those forces is zero.” Although a magnetic field is not (yet) a force, it is a vector, and so it’s mathematically the same. Anyway…. Don’t worry so much about which ground pads you’re using, because inside the PCB they are all connected (sure there might be a very tiny potential difference, but its not likely to have a noticeable effect). It’s most important that every wire has its “opposite current” ground wire running very closely beside it. Do this by twisting the signal wire together with its ground wire. Some esc manufacturers do this for you already, because they know it’s important for signal integrity (because they are electrical engineers). Also, the “reactance” you mentioned is just a component of total impedance, which is just total resistance for AC circuits. There’s inductive reactance and capacitive reactance, they both are measured in “ohms”, the same unit for resistance and impedance. Can I still use this board if I wanted to rotate it so that the XT60 is coming out the LEFT side? Would I have to wire the motors differently? Oscar I love your reviews. I am a long-time Flip32 Omnibus F4SD user with Stingy’s and Aliens. I wanted to join the hype train on BF 3.3 and 32k/32k so I purchased the Matek F722. I recently learned that we cannot run 32/32 until the code is optimized and the pushed it out to 3.4. Soooo, while I am waiting to build my 32/32 quad, what do you think about the Matek F722 as a flight controller? The last time I heard, BF devs will only begin to optimize the code for F7 in BF 3.4… so you can continue to use F4 for BF3.3 for now and there is unlikely to be any significant advantage to run F7 right now until 3.4. Hey Oscar. Did you manage to enable LED strip functionality on this board? My f405-ctr running the 1.8.1 inav hex from matek’s Product website page seems to hang on reboot after switching on led feature. Any ideas ? emh… sorry I am not currently using iNav, maybe that’s something you should report to the firmware developers or the reseller. I bought two FCs. One was shipped from Banggood Dec 17 and the other Jan 5. On the one from Jan 5 I can move the Led-strip to S5 and type some commands to be able to use the barometer and LED-strip simultaneously. On the slightly older one it doesn’t work. I want this qwad to be perfect and because the FC was (and is) out of stock I ordered one from another vendor. On this one it is the same. It doesn’t work to move the LED-strip to S5. After a discussion with Banggood they have agreed to send me a new FC as soon as it is back in stock. The question nagging me is: Are there two revisions of the F405-CTR? I do not have two different versions of the F405-CTR. However, a LED-strip connected to S5 tends to need a rectifier diode between 5V and the LED-strip. A 1N4001 will be able to safely drive 6 x WS2812B full on (bright white). so originally you can use either LED pin or barometer? That is bad, but who need barometer anyway ;) For GPS if you have M8N there is build in baro anyway right? I was planning the ultimate quad build with a FC that has on-board OSD, SD, and baro and to add sbus rx, s.port, s.audio, and GPS. I thought, the Omnibus F4 Pro V3 was the perfect solution but after purchasing it, I quickly found out that this FC only had 3 available uarts with no softserial capability so I was 1 uart short in building this configuration. I thought the maximum number of uarts on an F4 was 5, but features like SD, OSD, and baro require use of some of these uarts. The Matek indicates 5 uarts…..so it’s going to interesting to see if you there are 5 available uarts without disabling some of the on-board features. Still I was need only serial_tx for tramp telemetry, if you need full UART then most likely you need to remap second pin for serial_rx (like MOTOR 5). Using the ESC pads is probably okay because they are so close to the main power pads that the trace length is very short. I have been told this by several different board designers, although obviously the final decision is up to the pilot. Also, please be aware that the demonstrated method is not the absolute most efficient. The heavy ground wire does not need to go to the FC ESC- pad. The reason for this is that only the current draw from the FC itself needs to flow over the ground wire between the FC and the ESC. So a heavy-gauge wire isn’t needed. And current sensing only needs to occur on the vBat+ leg, so it doesn’t matter which negative pad you use on the FC. Good thinking about the ESC vBat- to FC vBat-. In an audio power amp doing it any other way would give hum in the speakers. Can you post a pic of this? I think I follow but don’t want to burn up my board… Thanks! The DAC pin is supposed to work without modifications for camera control. And it does. But your quad won’t arm if you use the DAC with BF 3.2.2 I believe it is scheduled to be fixed in 3.3.